Lis Mann trained for seven years in textiles and worked as a very successful textile artist and tutor for many years, exhibiting and selling her work in the UK and abroad, having had an earlier career as a social worker and counsellor. Further study led to a BA(Hons) in Fine Art from Buckinghamshire New University. 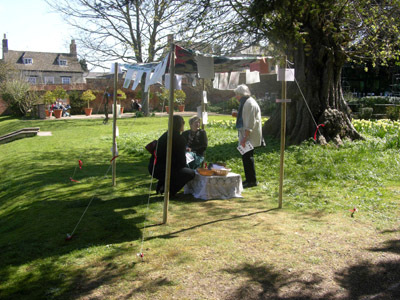 She studied for an MA in Social Sculpture at Oxford Brookes University; this brought her thinking full circle and she once again engaged with groups and communities as a facilitator for creative expression, using art as an intervention to discover and enrich people's creative experiences. Through the medium of clay and conversation she has discovered new ways to engage with a variety of groups in the community. For the moment, her making skills are on hold, as she has chosen instead to use the spoken and written word and performance as her means of expression.